Original Sheet Music with lyrics for 36 songs of 1912 and 1913. Roughly a third of these can be considered ragtime with lyrics with such songs as "Ballin' the Jack" and "Waiting on the Robert E. Lee". 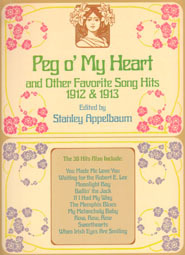 The original sheet music was loaned by the Archive of Popular America Music at UCLA, Sandy Marone, and David A. Jasen.